Confidence is up for both IT job seekers and recruiters in New Zealand with a rise in new projects increasing the IT jobs on offer and promising pay increases in 2014. 75% of employers are planning to hire new staff in 2014 (the majority within the next 3 months) with the main reason being new projects according to our latest Employer Insight Survey. Nearly 40% of hiring intentions are the result of new projects, followed closely by increased customer demand and increased demand of IT from the business, all reflecting the boost in industry confidence we’re seeing as the economy improves. Consistent with previous years, our Job Seeker Intentions Survey shows 67% of workers are planning to look for new work in 2014, the main reason being that it’s ‘time for a change,’ a positive shift from ‘low salary’ & ‘skills not being utilised‘ in 2013. And the work’s out there, we’re going to see a recruitment push for over 1,750 vacancies from these 400 employer survey respondents alone within the next 12 months, with high levels of permanent recruitment activity, in the private sector and public sectors. This not only shows growing employer confidence, but also indicates a move to a more settled workforce. Growth in confidence is strongest in the smaller regions, with Christchurch leading the way with 86% of employers planning to hire in 2014; up from 56% in 2013. Waikato/ BOP follow closely on 81% up from 63% in 2013, while 75% of Auckland employers and 73% of Wellington’s are intending to hire. And, employers’ efforts to retain and attract the best talent are really paying off with 85% of job seekers happy with their workplace, citing flexible working hours as the top non-financial benefit an employer can offer. Things are also positive on the remuneration front, we’re seeing 47.5% of employers saying they’re going to provide a pay rise in 2014, up from 44% in 2013 and only 6% ruling it out, a 66% decrease from our 2013 survey. The employer survey shows that while only 44% of employers were planning to give a pay rise in 2013, 75% actually did. If this trend continues then the 47.5% of employers anticipating giving one in 2014 could in fact be closer to 81%. Once again the smaller regions have come out on top with Christchurch and Waikato/BOP giving the most pay increases last year at 86% and 96% respectively, ahead of Wellington’s 66% and Auckland’s 76%. Looking forward, more Christchurch and Waikato employers are planning to give pay increases in 2014 at 68% and 65% respectively alongside 40% of Wellington and 49% of Auckland employers. It’s a sign of the improving economy that remuneration confidence is increasing strongly in the smaller regions however the big cities still hold the top median remuneration and are offering increasingly more benefits and bonuses. Competitive remuneration is crucial to helping retain talent. As our data consistently shows, money is one of the main reasons talent move jobs and look overseas. This is confirmed by the latest stats which show a consistent 34% of job seekers are planning to move offshore this year looking for money and career development. Fewer employers are using social media and websites to promote their employer brands, down from 56% in January 2013 to 51% this year – an interesting move considering more job seekers are using social media/websites to evaluate potential employers, up to 79% from 77% in 2013. Interestingly the job seeker’s use of social media has shifted to a source of more general information than a way to apply for jobs direct. Nevertheless it remains a valuable way for employers to encourage likeminded talent to their business. 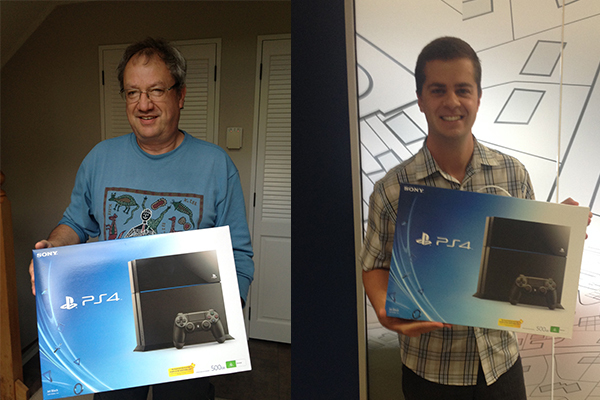 Congratulations also to the winners of our Employer & Job Seeker survey PlayStation 4 giveaways! John (Wellington) & Diego (Auckland) are pictured below with their PS4s.